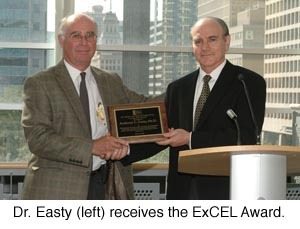 Clinical Engineering Professor Dr. Anthony C. Easty is the inaugural recipient of the Excellence in Clinical Engineering Leadership (ExCEL) Award from the American College of Clinical Engineering Healthcare Technology Foundation. In recognition of his demonstrated leadership of what clinical Engineers can achieve and what value they can provide to their institutions, Dr. Easty was selected for this “legacy of exemplary leadership in the field of clinical Engineering at University Health Network” (UHN). Under his leadership, the Medical Engineering at the UHN in Canada has evolved to expand its services, which now include: Device Selection and Purchase; Incoming Inspection; In-Service Education; Medical Device Repairs; Performance Assurance; Incident Investigation; Medical Device hazard Notification; Human Factors; and Research, Development and Education. As Chair of the Global eHealth Innovation, Dr. Easty is a well-recognized leader in clinical Engineering, whose career spans 30 years. He recently created a Medical Device Informatics group that overlaps the interdependence of clinical Engineering and information technology. “Under Dr. Easty’s leadership over the past three decades, the field of clinical Engineering at the University Health Network is credited as being one of the best in the world,” said Cristina Amon, Dean of the Faculty of Applied Science and Engineering. Dr. Easty is credited with establishing the largest human factors group in the world dedicated to health care and has extended his expertise beyond Canada as well. He co-developed the Canadian Clinical Engineering Standard of Practice and has consulted in countries around the globe, including Malaysia, Abu Dhabi, and Bermuda. Professor Easty is cross-appointed to IBBME and ECE as an Assistant Professor and leads the Medical Engineering department at UHN and Mount Sinai Hospital as Senior Director.